A couple weeks ago I called our friend Gary who is the wine maker of Smith Wooton and Croze in Napa Valley. 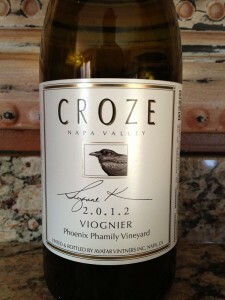 Recently Croze participated in the Premier Napa Valley event in Napa Valley at the Culinary Institute of America. The Napa Valley Vintners’ 17th annual Premiere brought in a amazing $3.04 million, nearly matching last year’s record-breaking event! The auction’s 211 lots donated by 218 Napa Valley Vinters members were purchased in just over three hours of lively and spirited bidding. More than 80% of the lots featured were from the 2011 vintage, which had an unusual growing season. However, the vigorous bidding at the auction proved that the skills and experience of Napa Valley’s vineyard managers and winemakers prevail, even when the growing conditions are less than perfect. I wanted to congratulate Gary and Daniel for the recent five lot award. The winning bidder paid $9,000.00 for five cases of a special Cabernet Sauvignon blend that will be released this fall. I have to say I’m jealous because I am sure the Cabernet Sauvignon is excellent! During our call, we also spent the time to catch up on things. We have an upcoming ten day trip to Napa and I invited Gary and his wife Suzanne over to the house for a barbeque with some other Napa friends. Gary will also traveling to Minnesota early May and I suggested a wine dinner at one of our favorite wine bars; Nectar Wine and Bistro in Osseo. He sounded interested and was going to talk to his Minnesota distributor, so hopefully we can make it happen! We wrapped up our phone call talking about the recent release of the 2012 Suzanne K Viognier. If I understood Gary, they bought a small lot of grapes last year as Daniel (their wine maker) wanted to make a Viognier. I mentioned that we were planning to have fish tacos that upcoming Friday and I planned on trying the Viognier. Gary was happy to hear about the plan and was curious to see how we liked the Suzanne K Viognier. Finally Friday came and friends Dave and Heather joined us for dinner and wine. The fish was almost ready when I decided to pull the 2012 Suzanne K from the wine cooler. 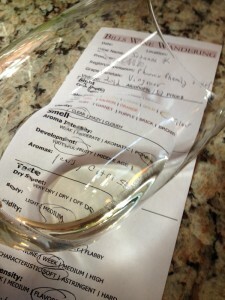 I grabbed us glasses, cork screw and my tasting sheet. I enthusiastically pulled the cork and poured each of us a glass. With my tasting sheet we proceeded to try the Viognier before we ate. The color depth was thin. We all were intrigued by the clear, silver hue. The aroma was very powerful! The Viognier was very young and we could instantly smell pears with a secondary citrus nose. We could not help ourselves to keep swirling the Viognier in our glass and putting it to our nose. There may have also been a floral note. The initial taste was the wine was sweet with a very crisp finish. The acidity was perfect and my mouth watered with every taste. It was flavorful and we spent some time trying to determine the other flavors. The Viognier was very fruity with melon, apricot, and lemon notes. It did not take any time for us to finish our first glass! We proceeded to make our fish tacos and sat down to eat. The Viognier was a perfect match. The slightly spicy Chipotle sauce paired with the Suzanne K perfectly! We were sad when we finished our final glass knowing we did not have another bottle. It is was not difficult for the four of us not to rate the 2012 Croze Suzanne K Viognier four glasses. Not just because they are friends, but because the Viognier was damn good!